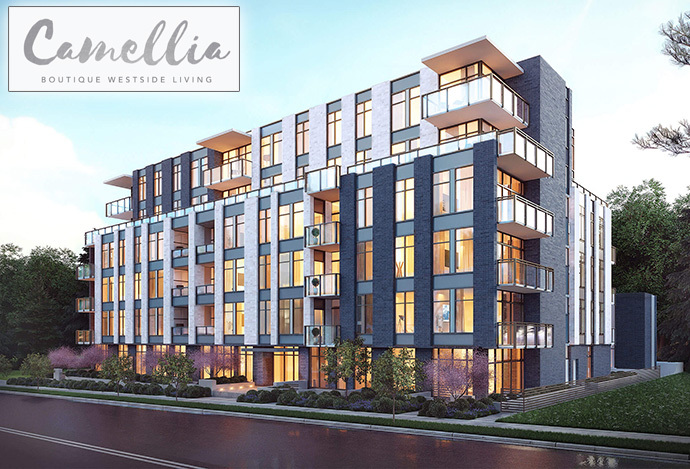 A small and boutique development on the Westside of Vancouver is now selling at Camellia, located at Cambie Street and West 51st Avenue. The six storey building in South Vancouver is offering only 56 condo residences and 6 townhouses that are separated by a private courtyard. The developer for the Camellia Vancouver condos is Minglian Group and the architecture is designed by award winning firm GBL Architects. The modern and timeless interiors are designed by Lot 30 Design. Just a short walk from Langara College in addition to having easy access to the convenient Canada Skytrain Line to get you to downtown Vancouver or to YVR Airport and Richmond, the centrally located Camellia Vancouver condos also present a walkable neighbourhood that is full of services, cafes, restaurants, stores, boutiques and much more. Bus stations are also nearby as are mass transit routes. Some of the location highlights also include Oakridge Centre and Langara Gardens. The presale Vancouver Camellia condos also offer a resident only private rooftop terrace that features views of the Langara Golf Course. There are also urban agriculture plots. In addition, residents can also enjoy an outdoor leisure space as well as an indoor fully equipped fitness gym. The floor plans range from 630 square feet and between one bedroom to three bedroom residences. The South Vancouver Camellia condos are also featured at a sales centre located at 5890 Cambie Street. The starting price point is from $1,110 per square foot. The Camellia Vancouver Westside condos are located at Cambie Street & West 51st Vancouver and are close to many community amenities. The project consists of a six storey boutique low-rise building with only 50 condominium residences (single level) plus six multi-level townhouses. Many of the homes at Camellia Vancouver condos will have stunning views of Langara Golf Course and some will have private rooftop terraces. The community will feature beautifully landscaped courtyards, secured underground parking, solid concrete construction, LEED Gold certified features and the 2/5/10 Home Warranty Coverage. On-site, residences can enjoy a fully equipped fitness gym, outdoor leisure area as well as urban agriculture plots. For more details, you can visit www.camellialiving.ca or you can fill out the online form at the top of this page for more details. Please note that the official presales are expected to begin in late Spring 2017. 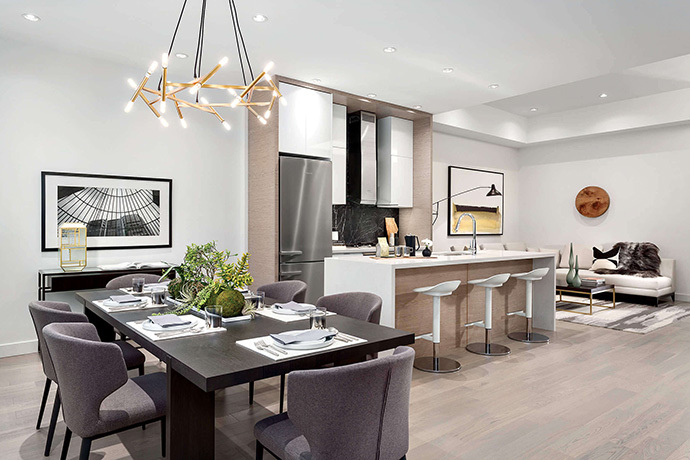 The interior design for the beautiful Westside Vancouver condos at Camellia Living include two professionally selected contemporary colour palettes that are called Cool Grey and Walnut. The homes will have 10 foot ceilings throughout plus engineered hardwood floors in the living and dining spaces plus all bedrooms for that urban modern look and feel. The Camellia boutique Vancouver West Side condos will also feature geothermal cooling and heating systems plus 24” Blomberg front loading washer and electric dryer. The kitchens feature top quality stainless steel appliances by Miele (for 2 and 3 bedroom suites) that include 30” bottom freezer fridge, 24” dishwasher, 30” gas cook top, 30” electric wall oven, 24” microwave and 30” hood fan. For 1 bedroom units, the Vancouver Camellia condos will feature Fulgor and Blomberg appliances that include 30” bottom freezer fridge, 24” dishwasher, 30” gas cooktop, 30” electric wall oven and a 30” over the range integrated microwave/hood fan unit. The kitchens will also feature contemporary wood veneer cabinetry on kitchen island, sleek high gloss finish on upper and lower cabinets, modern faucets and fixtures as well as a stainless steel undermount sink. Other kitchen features include an elegant large format marble tiled backsplash plus engineered quartz counters. The bathrooms at the presale Vancouver Camellia West Side condos include sleek high gloss cabinetry in the ensuites and master plus elegant marble counters and undermount sink, polished large format tiles on the shower and tub surrounds plus a deep soaker tub. There are stylish modern mirrored medicine cabinets in the ensuites. The bathrooms also feature quality porcelain tiled flooring, modern faucets and hand-held shower fixtures and slim profile dual flush toilet. Some of the draft floorplans at Camellia Vancouver have been released. Please note that these are subject to change at any time and availability will vary. Plan A5 is a 1 bedroom and 1 bathroom unit at 630 – 631 square feet. Plan B2 is a 2 bedroom plus 2 bath unit at 832 to 837 square feet. Camellia Floor Plan C6 is a spectacular 3 bedroom plus 2 bathroom layout with a huge terrace and separate deck. The unit is 1073 to 1074 square feet in interior space. Plan P4 is also a very large 1,006 square foot 3 bed/2 bath unit will large horizontal deck. Camellia Floorplan P4-A is a penthouse unit with 3 bed/2 bath at 1,116 square feet plus a huge roof deck. A home of distinction, Camellia encompasses 56 luxurious condominiums in an architecturally unique six-storey building along with six spacious townhomes separated by a private, beautifully landscaped courtyard. Solid concrete construction, highly insulated walls, expansive rooftop terraces, and the innovative design – an elegant contrast of white and dark manganese-coloured brick wrapped around the building – exemplify quality and prestige. The development has been designed to be LEED Gold certified and will participate in testing and verification during the LEED certification process to ensure designed elements have been installed to meet LEED targets. For more information on LEED, you may download a document linked below or visit www.usgbc.org. The Camellia project team includes the Minglian Group developers, GBL architects and Lot 30 Design.